After starting to worry that my husband would miss our third sons birth, I woke at 2.30am to surges starting, mildly and with plenty of time between. I alternated between bed and wandered the loungeroom, using my HypnoBirthing techniques until hubby woke at 5am. After having him stare at me for 10 minutes, I decided we would go back to bed for little while longer. By 6am it was getting far too uncomfortable in bed so we got up and I sat on my birth ball, I emailed the person I was meant to be meeting in a few hours to cancel, I texted my midwife just to give her the heads up, I also rang my mum to let her know to turn the heaters on as we were having a home birth at her house next door. I settled into my early labour prep and relished in this preparation. Hubby also got in contact with our sister in law to watch our second son as the eldest had kindy. He did a run for bread and milk so everyone would have something to eat and drink throughout the day. At 7am my sister in law had arrived, hubby had sorted out food and the kids were waking up, I gave them both a kiss, settled them into the morning, before I decided it would be best if I moved to mums. While surges remained mild and spaced, I knew from my childbirth preparation they would fizzle out if I remained in the hustle and bustle of home in the morning. Glen got the kids sorted for the day, bringing our eldest down for a last kiss and cuddle before it was off to kindy. He was very excited he might have a baby by home time . My labour gradually built up, I alternated between walking and using the lounge chairs to lean into and resting on the couch, I had 2 showers throughout the morning which were fabulous. My second shower was just after things started to ramp up, my surges were starting to feel quite intense while still 8mins apart at 11.30am. As I continued using my HypnoBirthing tracks and techniques, it was time to give the midwife an update! Glen and the midwife played a little bit of phone tag and by the time she spoke to my mum while I was in the shower she could hear it was time to get here. I moved into my birth space feeling calm, comfortable and completely in control. 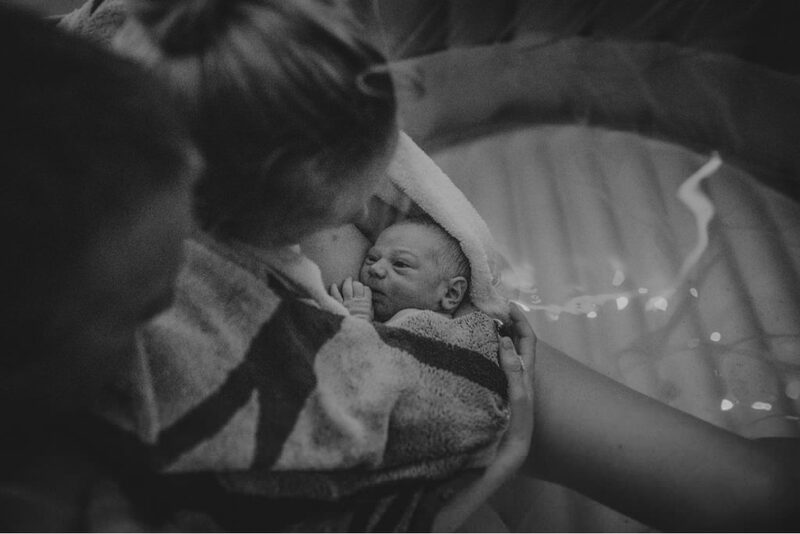 When I realised my midwife was present as the second midwife, the student and the birth photographer walked in, I did become overwhelmed, having a little cry. It was 12.45, I used the other room to calm myself and come to terms with the fact baby would be making his arrival shortly and I would be a mum of three. I moved back into my birth space, using the dining chairs to support myself with surges. I continued listening to my rainbow relaxation, using my clary sage in the diffuser and my HypnoBirthing breathing techniques. It wasn’t long after this I moved into the bath changing positions a few times as the last remnant of my cervix moved up and over baby’s head. It was time to breath baby down to birth and with each surge I felt baby coming closer to being in my arms. At 2pm exactly my baby boy was brought earthside, brought up onto my chest with my own arms. The whole time Glen was there, touching me when I needed him to be close and just being there when I needed space. A beautiful birth that showed me even more than before how much your mind plays a role in birthing, it can make or break even the strongest of women! My HypnoBirthing preparation was paramount in providing a perfect birth for my family.